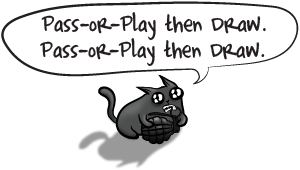 To start, remove all the Exploding Kittens 9 from the deck and set them aside. 2-3 players: Use only the cards WITH a paw print in the corner (44). 4-7 players: Use only the cards WITHOUT a paw print in the corner (69). 8-10 players: Use all of the cards (113). Remove all of the Defuse Cards from the deck and deal 1 to each player. Insert any extra Defuse Cards back in the deck (if there are any). Each player starts with a Defuse Card; the most powerful card in the game. These are the only cards that can save you from Exploding Kittens. If you draw an Exploding Kitten, instead of getting exploded, you can play the Defuse Card and reinsert the Kitten back into the Draw Pile anywhere you'd like in secret. Try to get as many Defuse Cards as possible. Shuffle the deck and deal 7 cards face down to each player. Everyone now has a hand of 8 cards total (including the Defuse Card). Play a card by placing it FACE UP on top of the Discard Pile and following the instructions on the card. After you follow the instructions on the card, you can play more cards. You can play as many cards as you'd like. End your turn by drawing a card from the top of the Draw Pile into your hand and hoping it's not an Exploding Kitten. (This is different from most games in that you END YOUR TURN by drawing a card). Remember: Play as many or as few cards as you'd like, then draw a card to end your turn. The last player who hasn't exploded wins the game. 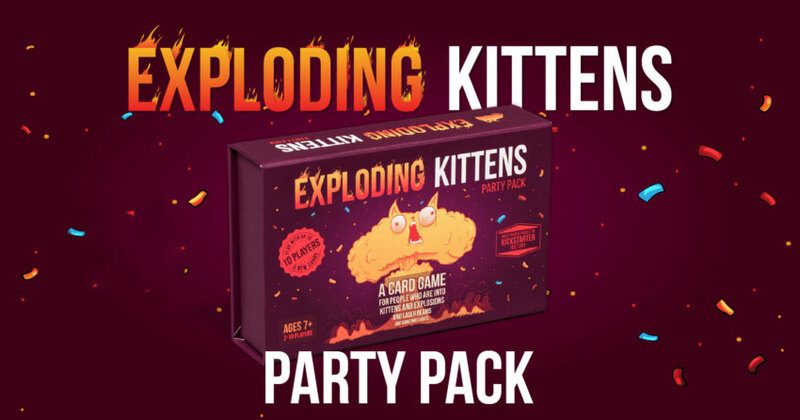 You won't ever run out of cards in the Draw Pile because you inserted enough Exploding Kittens to kill all but 1 player. Try saving your cards early in the game while your chance of exploding is low. You can count the cards left in the Draw Pile to figure out the odds. Some cards don't have any instructions on them (Cat Cards). These cards must be collected and played as matching Pairs. If you play matching Pairs of Cat Cards, pick another player and steal a random card from their hand. Want to screw over the player right after you? Put the Kitten right on top of the deck. If you'd like, hold the deck under the table so that no one else can see where you put it. Your turn is over after playing this card. End your turn without drawing a card and force any other player to take 2 turns in a row. This is not the same as drawing 2 cards in a row! The target of this card should take their first turn (play cards and/or draw). When their turn is over, it's their turn again. If the targeted player plays a Slap Card in return, they pick a player to take ALL remaining turns (4 turns, then 6, and so on). Play always continues from the targeted player. 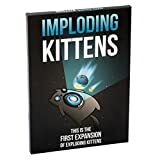 If you draw and defuse an Exploding Kitten during a series of turns, you must continue taking your remaining turns after you reinsert the Kitten. Triple Slap works the same way as Double Slap, but adds 3 turns instead of 2. Immediately end your turn without drawing a card. (For example, if you play a Skip Card in response to a Double Slap Card, it only ends 1 of the 2 turns. Playing 2 Skip Cards would end both turns). Reverse the order of play and end your turn without drawing. If you play this card after you've been SLAPPED, the order of play is reversed, but you've only ended 1 of your turns. Shuffle the Draw Pile without viewing the cards until told to stop. (Useful when you know there's an Exploding Kitten coming). 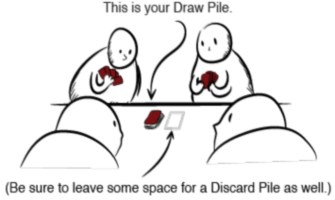 End your turn by drawing the bottom card from the Draw Pile. Privately view the top 3 cards from the Draw Pile and rearrange them in any order you'd like. Return them to the top of the Draw Pile face down, then continue with your turn. Stop any action except for an Exploding Kitten or a Defuse Card. Imagine that any card (or Pair of Cat Cards or Special Combo) beneath a Nope Card no longer exists. You can play a Nope Card at any time before an action has begun, even if it's not your turn. Any cards that have been noped are lost. Leave them in the Discard Pile. These cards are powerless on their own, but if you collect any 2 matching Cat Cards, you can play them as a Pair to steal a random card from the other player. They can also be used in Special Combos (below). Use as any Cat Card (any of the cards with no instructions on them). This card cannot be used as a non-Cat Card (Shuffle, Double Slap, etc).